When I discovered Marcie Forest and her wonderful work at the Forest Candle Studio, I was simply transfixed. She wasn't just making candles from beeswax, she was actually creating the most amazingly beautiful small flower sculptures. And not only that, but they were in the shape of one of my "favorite" flowers, the rose. 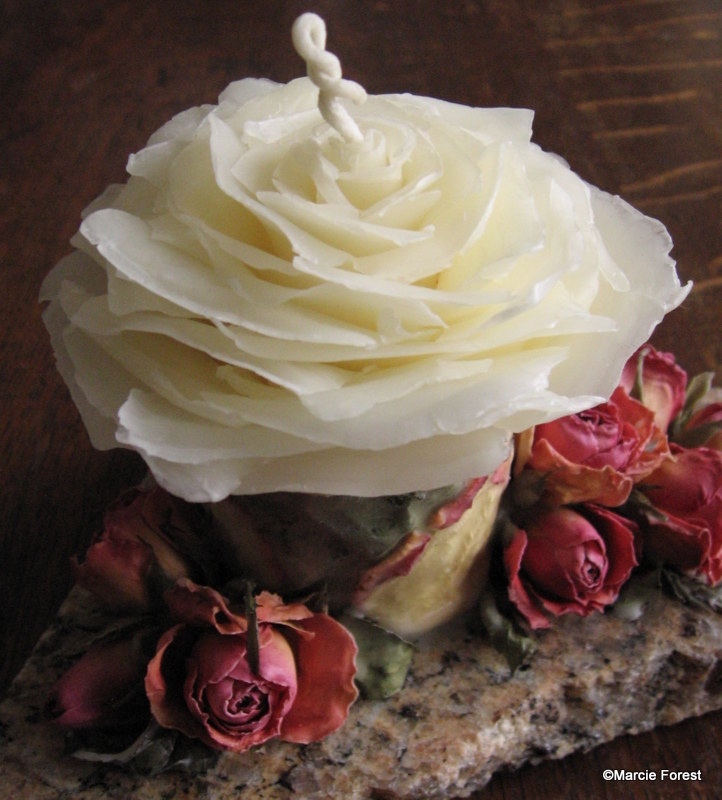 Since roses are considered to be one of the three sacred flowers and Marcie's work is so artistic, I thought that I would like to know a bit more about this highly creative person, her rose sculptures and her candle business. I hope you will enjoy this inspirational interview with Marcie Forest as much as I did! MBS: Can you tell us a little about your background? How did you get started making art? Marcie: As far back as I can remember I've loved art and felt a strong need to be creative. Some of my most joyful childhood memories growing up in the 1950's in Houston, Texas are: my mother taking me to art museums on weekends and my father playing jazz on his saxophone to me at bedtime. And with each new class in ballet, piano, drama and art I thought, "I'll be a dancer, a pianist, an actress, an artist!". I learned early on that creative expression has many forms. Exposure to talented artists in many fields made me want to explore what I could become talented at and eventually have a career in. Over the next two decades, through formal study and self-teaching, I learned a wide variety of art skills. Some were passing fancies, others I became very committed to. I also had the opportunity to travel the US and Europe, soaking up the art, architecture, landscape and culture. These were all fantastic experiences that continue to inform my art-making today! Settling in Southern California, my husband and I sold our hand painted and silk-screened clothing at a little boutique we opened on the Venice Boardwalk. The children's art classes I taught privately and in the community also helped contribute to supporting ourselves and our two young children. It was an exciting time and the future looked promising. Then, as life would have it, my husband was seriously injured in an accident and suddenly it was all up to me to take care of the family. I decided to trust my faith in myself as an artist and my ability to adapt to the situation and attempted a bigger leap into making a living as an artist. What an unexpected turn of events followed that decision! I was studying encaustic painting with Ann Thornycroft and fell in love with working with beeswax. Then a friend took me to lunch at a place I hadn't yet been to - The Rose Cafe in Venice, CA. It was beautiful with an art gallery atmosphere and rose gardens surrounding the cafe. I approached the buyer for their gift shop about making hand painted clothing with unique rose designs exclusively for them. The buyer said they weren't interested in clothing but they would be interested in candles. Immediately an image came into my mind of a candle shaped like a rose, mounted on rock, surrounded by dried roses. She was excited about it and told me to bring her a sample. 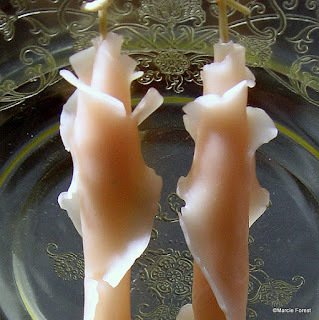 I had always loved candles but had never made them before. So day and night over the next 6 weeks I studied traditional candle-making methods and then developed my own. 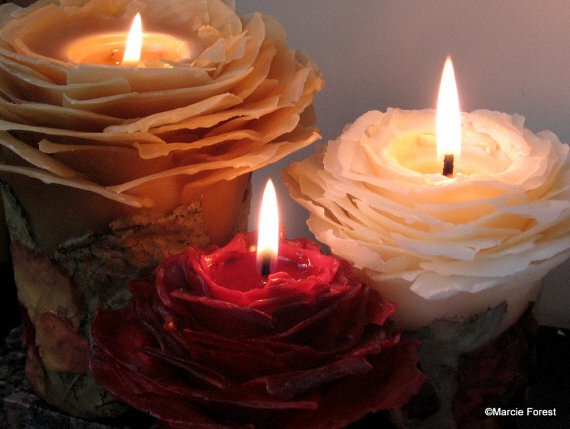 It was important to me that my candles be individual sculptures, evoke feelings of love for nature's beauty, and be made of pure beeswax, natural stone and air-dried roses. 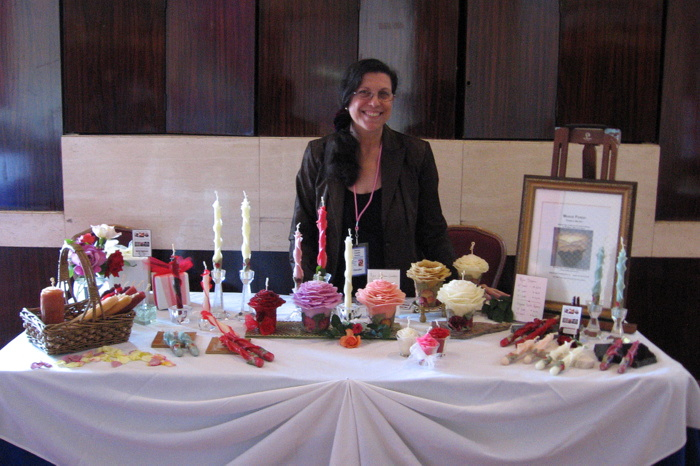 As soon as I made the first finished "candle sculptures" available to the public they were a big hit! That was in 1996 and they are still going strong. Over the years my candle designs have continued to evolve. I am always learning something new from experimenting with my own ideas and customers' requests. MBS: It seems like the image of a rose has been a reoccurring theme in your work over the years. The rose, as you may know, is one of the three historical sacred flowers. What is it about that image that you find so appealing? Marcie: As visual inspiration they are amazing - so many colors, shapes and varieties. It's much more than that though. Roses thoroughly engage my senses in a way that brings serenity and deep satisfaction. They are enchanting with their captivating scents, velvety soft texture, the natural light glowing through their delicate circular layers, and the way they change from day-to-day as their densely packed petals unfurl to expose a beautiful and mysterious center. As an artist I hope to spark a similar sensory and emotional engagement for those who encounter my work. 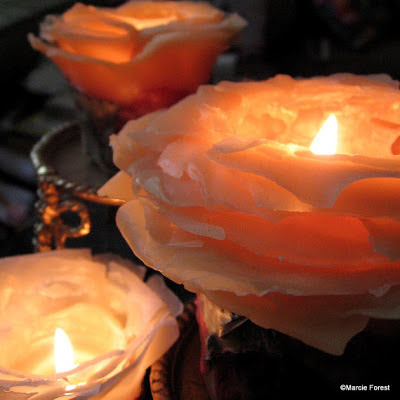 I find a deep connection of sensuous and symbolic aspects shared between roses, beeswax and candles. Highly valued throughout history, they are life-affirming symbols of love, celebration and remembrance. To me they are ideal together to create powerful works of art that convey their combined aesthetic, emotional and spiritual qualities. MBS: Tell us about your process. How do you create your candle sculptures? Marcie: Rose gardens are abundant here in Los Angeles, providing me with continual inspiration. On my walks, I sometimes take photos for later reference. At random times, fully-formed images of new work will pop into my mind and I make sketches with notes so I don't forget what I'm thinking about. New ideas also come when customers ask if specific details can be incorporated or to fit a particular situation. It gives me joy to connect with others through my work, knowing it brings them joy as well. Crafting the candle sculptures is quite complex. Over the years I've learned that some aspects require very exacting skill and critical timing whereas others allow for spontaneity and freedom. The process demands close attention, adaptability and patience, nourishing me intellectually, creatively and spiritually. Shaping each rose candle is a meditative experience, instilling in me a love for my work and the people who will receive it. The beeswax, being a natural material, handles differently depending on the weather and seasons. In fact, I can tell when the weather is changing just from how the beeswax handles! In winter it's especially more difficult to work with than in summer - it takes much longer to melt &/or warm up for pliability, and cools faster so that I have to reheat it more often and work with it more quickly. I begin by pouring wavy-edged sheets that I tear into smaller pieces. 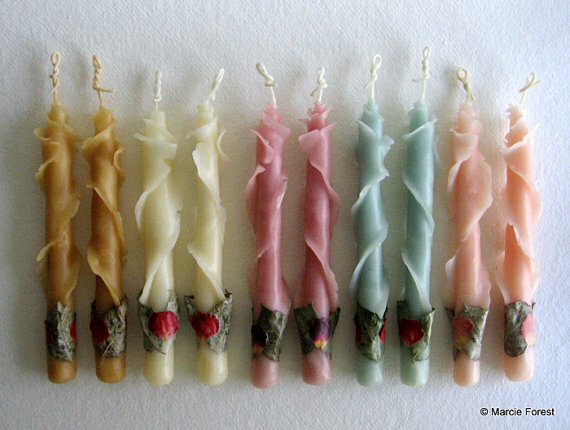 Then in a series of stages taking many hours over several days or more, I hand-build, shape and dip the delicate layers of beeswax until satisfied with each candle design. For adornment, I air dry whole roses, petals and leaves, hand-dipping them in beeswax to preserve their natural beauty. I also use other flowers, organic spices and herbs, and eco-friendly metallic paints and glitters on some designs. For the candle bases, I hand-cut granite and other beautiful or unusual types of stone. My intention is that each candle be unique and have its own identity. MBS: You've created these wonderful designs for a number of years now. How have they evolved from your original idea? 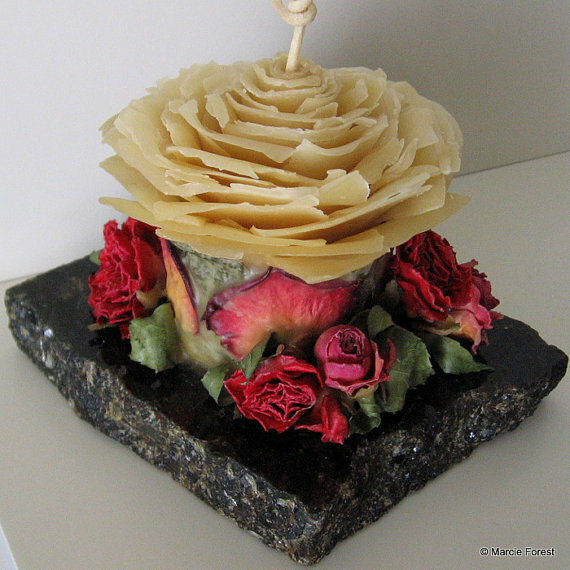 Marcie: For the first year I only made what I call "Rose Candle Sculpture", which are the ones mounted permanently on a stone base with dried whole roses attached. Many of those first candle sculptures were much smaller than the ones I make now. In retrospect, I think they were small because I was figuring out how to make them and how to sell them. Within one year my candles were selling well in over 10 local candle and gift shops, and the shop owners all told me that their customers said they were so pretty they would never burn them. That was a wake-up call! 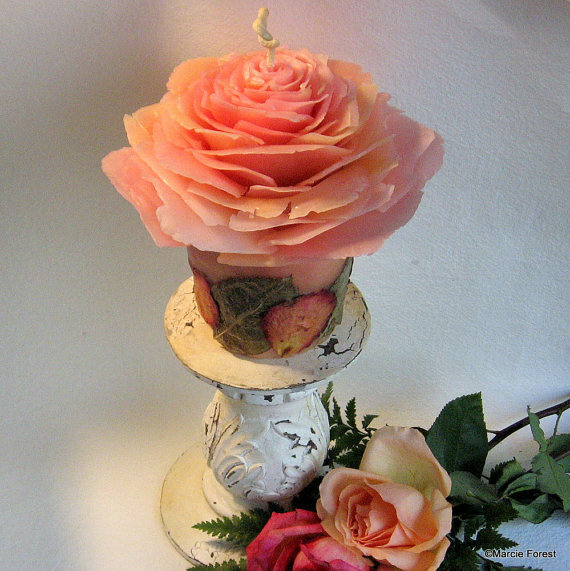 So next I designed little rose-shaped refill candles so customers would know they could light the candle sculpture and replace the burned out core and still have it look like a rose. During the next year I also designed several different sizes of large free standing rose-shaped candles (what I now call Rose Garden Pillars). The year after that customers were asking for tapers. It took me a long time to design a taper that had a feeling of looking rose-like and kept those sculptural qualities as the taper burned down. All the styles were popular which kept me extremely busy, helping my technique and the work itself to improve. Over the years I became more adventurous with shape and the rose candles are more flared out now than they were early on. Also I started making rose candles that I call "column style". These are basically straight-sided but have my signature wavy-edged thin layers so that the candles still have a delicate rose-like layered look. In the last couple of years I added to my designs by trying out various new adornments: organic spices, crushed rose petals, organic lavender buds, glitter, etc. The most recent new design is my luminary rose candle, which took nearly two years (off and on) in development. Another evolution has to do with color. Those first few years I was only working with honey amber beeswax and customers started asking if I had any other colors. I was hesitant to try that because I knew there would be multiple problems to sort out both logistically (need a dipping pot for each color) and design-wise (it's much harder to choose which rose petals look best than on white or amber beeswax). Eventually I became so intrigued by what I might design that I started experimenting with hand-dying the beeswax. I'm so glad I did because I love it! It's definitely harder to work with from a technical standpoint (each color handles differently) but it's worth it. About two years ago I began to occasionally use more than one color combined in a single candle. MBS: Any ideas on where on expanding the designs for the future? 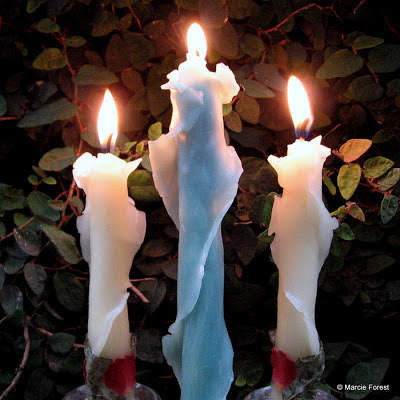 Marcie: I think of my candles as dynamic "living" sculptures, responsive to their environment, with their own light from within and their changing form as they burn down. Being fascinated with how light and color reveal form, create mood, and evoke emotion, I plan to continue playing around with shape, form and coloration in different ways. Marcie: On a weekly basis I have three basic types of work days: 1 day out of the studio for picking up supplies, mailing packages, library for research materials, and any other business errands; and 4-5 days working in the studio that vary in length from 6-12 hours a day. Time in the studio is divided among making the candles, administrative tasks, and researching and developing new ideas. Most days I work long hours but I love the flexibility and independence that comes with working for myself. My work day usually starts around 10am. The first thing I do is put my two largest wax pots (one amber, one white) on the stove. It can take 2-4 hours for the beeswax to melt depending on the weather temperature. Meanwhile I eat breakfast, do my morning stretches, check my Etsy shop, emails and phone calls. Then I look over my order sheets and weekly calendar notes and decide what tasks need to be accomplished. The candles have a lot of steps that need to be taken in a certain order for the various stages of production. Also, there are a lot of materials used in the making and packaging of the candles and they all require prep work. Prepping the materials and crafting the candles require intense mental and physical focus, so I usually work in 2-3 hour increments with 1-2 hour breaks in between. For part of the break time I may do administrative tasks, the rest is spent relaxing, talking to family and friends, eating and replenishing my energy. At some point in the afternoon I take a long walk to enjoy the outdoors, get exercise, and clear my head. I usually listen to music on Pandora when candlemaking - I love a wide variety of music, choosing whatever enhances my energy level and mental state at the time. I sketch ideas and make notes whenever ideas come to me. Some of the work time is spent taking care of the business side of things. I photograph my work, design and print all my marketing materials, create the content for my Etsy shop and social media pages, and network online and in person to meet colleagues and make new business contacts. I end my work day with checking my emails and Etsy shop again, participating in Etsy team activities, making notes in my weekly and monthly calendars, and reading research material I've gotten at the library. MBS: I originally ran across your wonderful work online. How has the whole online/social networking experience been for you? Marcie: So far it's been a great experience. I've met lots of wonderful people and made new friends online through having my Etsy shop, participating in Etsy teams, and having a Facebook business page. I have a Pinterest page too but haven't had time to work on it as much as I'd like. It takes a lot more time to establish and maintain an online presence than I initially expected, but in reality it's probably less than it would take to have one's own brick and mortar shop. It's fantastic seeing other artist's work and reading about their journeys, and being connected to people around the world. People have been very supportive of my work online and I'm so grateful this opportunity exists. MBS: What are you currently working on? Any particular projects or shows in the works? Marcie: Weddings and gifts for special occasions are now a major focus for my work. These candles are usually made to order with customized details, so I no longer sell wholesale to shops, preferring to work in direct contact with my customers through my online venues. 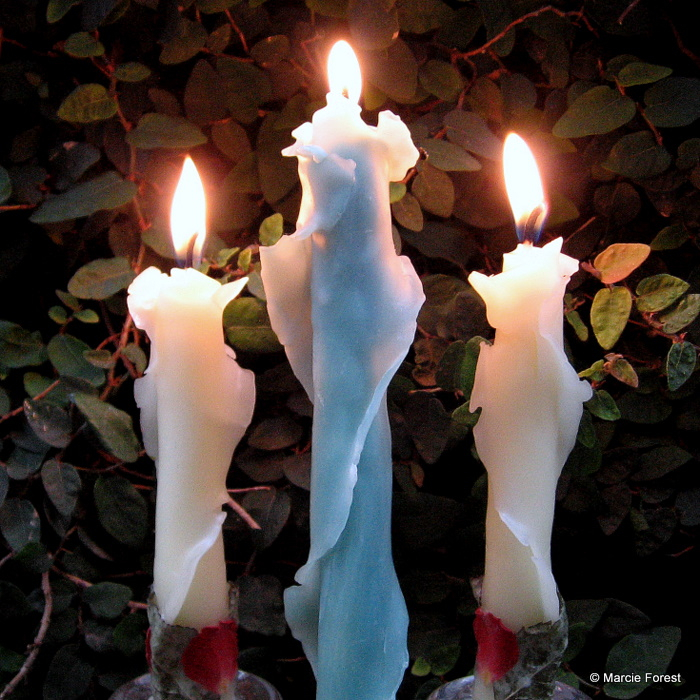 It's exciting work as each candle is different and offers challenges to me as an artist. I love working together with these customers to create something that has so much meaning to them. Because my candles are so unique, romantic, and can be made to match the wedding couple's vision for their special day, they have become sought after for Unity ceremonies, wedding reception table decor, and gifts for weddings and engagements. New colors and adornments are in the works to give wedding couples more choices. Future projects revolve around wedding, holidays and home decor. I've been approached by several wedding and home decor magazines and blogs to feature my candles in their print and online publications. I'm working on creating new designs to showcase this summer and fall. MBS: You had an idea, or vision to create this very inspiring work. You had the courage to follow that vision...which is not something that I'm sure was easy to do...and many people in your position would not have done. Through your experience what advice do you have for others. "Following your heart" a lot of times is easier said then done.